This is the first ever of its kind. 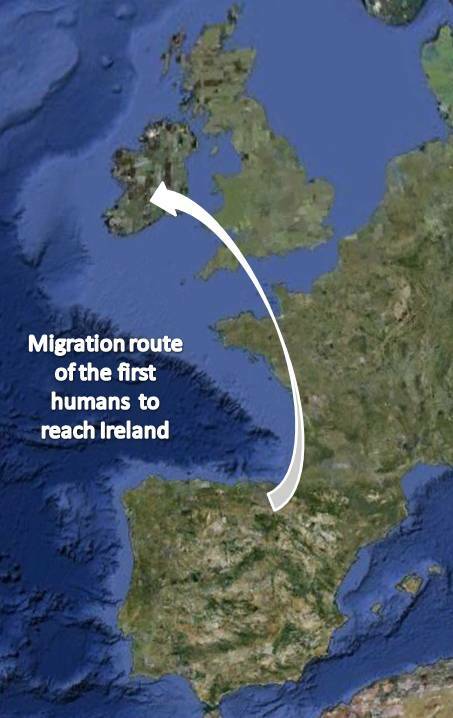 The descendants of the Scots, English and Welsh (plus later Palintines) who poured into Ireland from the beginning of the 16th Century, can still be found farming the lands that their ancestors first settled hundreds of years ago. They brought with them their own unique surnames, and each surname on the map is colour coded to denote a surnames origin. Each surname is positioned in the location where farmers with a particular surname concentrate in early census data (see attached Johnson image as an example). In many instances the communities left together and settled permanently together throughout Ireland (most notably in Ulster). 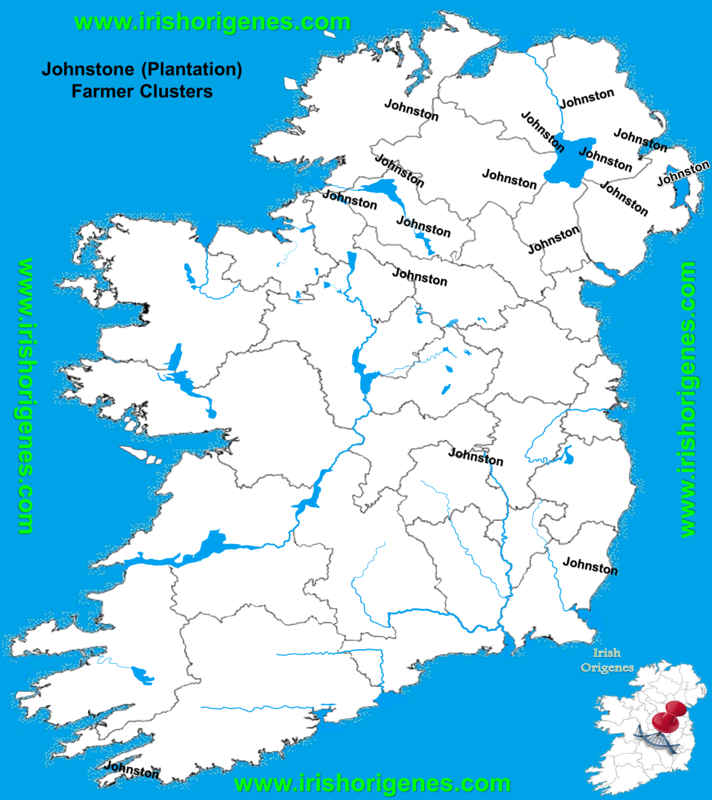 For instance, Border Scots Dumfriesshire families like the Johnstones, Scotts, Grahams, Bells, Irvings and Elliotts can be found together in many locations throughout Ulster. In turn, generations later, the 'Scots-Irish' would depart together for the Americas! So if you know where your Scots-Irish ancestors first settled in the Americas, then this map makes it possible to link them back to a particular location within Ulster, and then ultimately to an origin within Scotland (something I now do routinely for my customers). Alternatively, if you have commercial Autosomal DNA test results (Family Finder, Ancestry.com, 23andMe, MyHeritage) then I can analyse those results, identify hotspots in Ireland associated with your Scots-Irish ancestors, and then determine where they originated within Scotland. Contact Irish Origenes for a FREE CONSULTATION click here. The map has revealed some interesting findings, many Scottish Gaelic Surnames are become 'Irishised,' for example 'MacCrindle' became 'McReynolds,' and MacKay became McCoy. It has also dispelled some persisting myths; the 'Mahargs' are not Grahams in disguise (Graham spelled backward is Maharg). In fact, they are Scottish 'MacHarg' from Galloway. 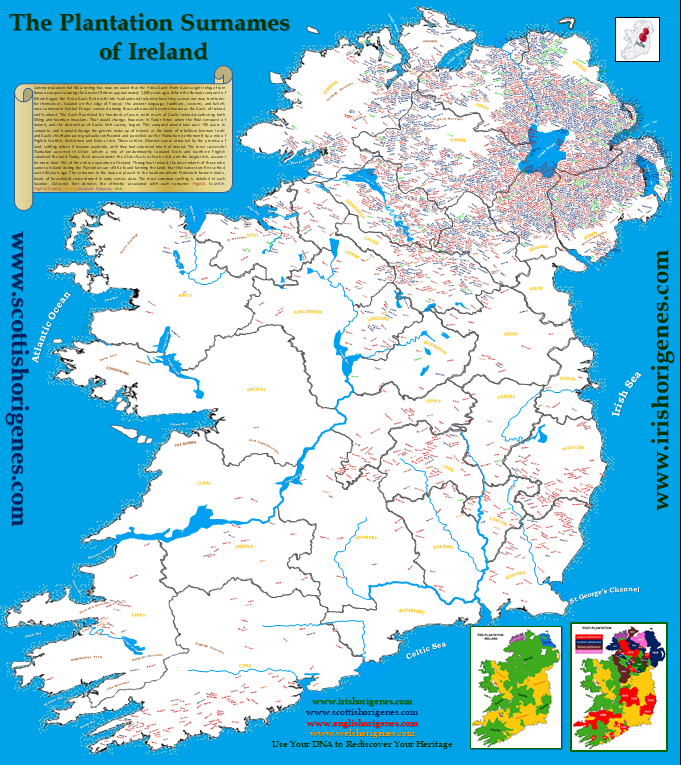 In addition there are a considerable number of Gaelic surnames that appear on the map that do not have a Scottish equivalent, they are in fact native Gaelic Irish surnames, whose forebears became Protestant (a much unreported mini Irish Reformation perhaps?). 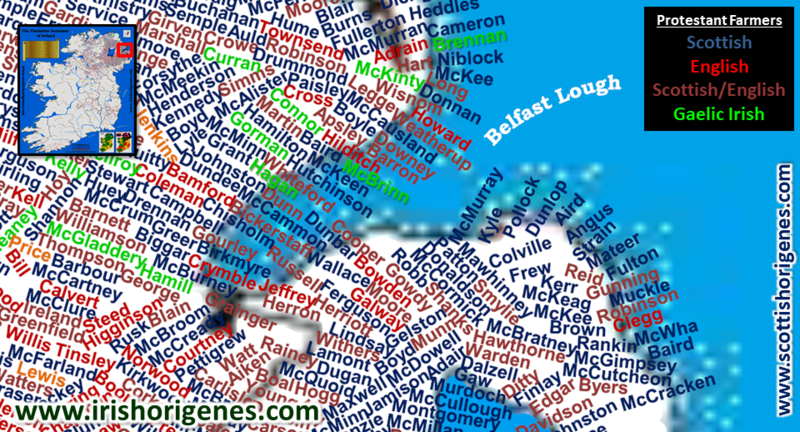 The DNA of the Ulster Scots has revealed even more surprises! Many of the Scottish Gaels from Galloway in Southwest Scotland, who made up a large proportion of Planters were in fact descended from Gaels from Ireland who had conquered and colonised Galloway 500 years earlier. Their descendants would merely return to Ireland as predominantly English speaking Protestant Scots (most also spoke Gaelic). 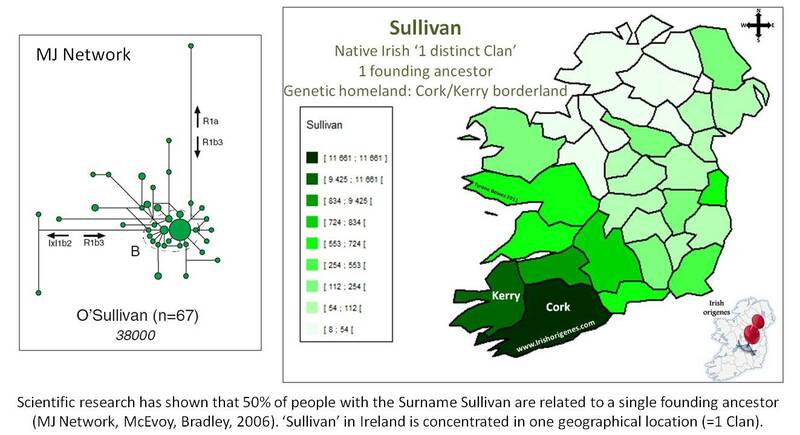 Today, if you have Ulster Scots DNA, chances are that you carry ancient Irish DNA markers. Contact Irish Origenes for a FREE CONSULTATION on your DNA test results or to find out about commercial DNA testing (click here). What will your DNA reveal about your Scots-Irish ancestors?